Red, Pink, and Olive Wood? Fair trade is not the first topic that comes to mind when thinking about Valentine's Day. But as a significant chocolate, card, and gift holiday - it probably should. Let's take chocolate for example. You can purchase Valentine's Day chocolate boxes at retailers all over the world. Some of this chocolate is very tasty and communicates your thoughtfulness towards the recipient. 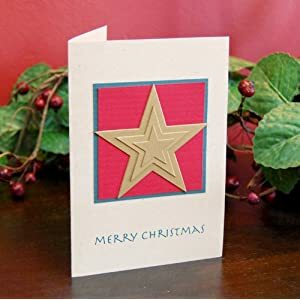 However, many of those chocolate boxes shaped like a heart and wrapped in red cellophane only serve to add width to the hips with very little joy on the tongue; not very romantic or thoughtful. Valentine's Day is a perfect holiday to show the people you care about that you also care about the many people around the world who benefit when you buy fair trade. If you are looking for some really good chocolate that also serves the cocoa farmers of the world, check out this site that has several brands listed that sell certified fair trade chocolate. But don't just give your loved ones chocolate. 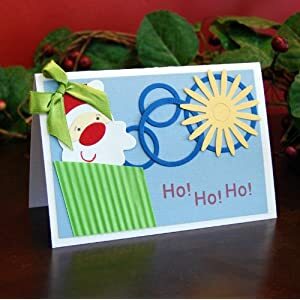 Give them a gift they can use and remember for several years to come. From The Earth, a fair trade company, has several excellent Valentine's Day gift ideas for the special people in your life. 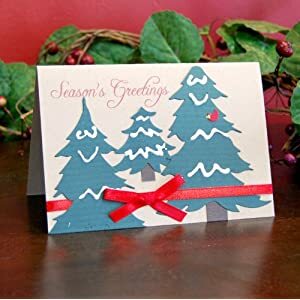 Whether you want a unique, handmade card or jewelry each purchase you make will be a help to the community of Amman, Jordan. 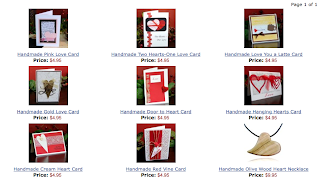 Nothing says, "I love you" like fair trade Valentine's gift. Let's be honest though, nothing says, "I love you" like exquisite, unique jewelry. Thankfully both can be true when you purchase From The Earth jewelry on Amazon.com, Amazon.com/UK, Amazon.com/FR, or from one of our many locations in Amman,Jordan. 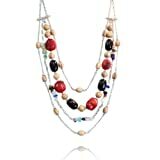 The Cascading necklace is truly unique with it's olive wood, red coral, and black onyx stones. The set also contains coordinating earrings and bracelet. 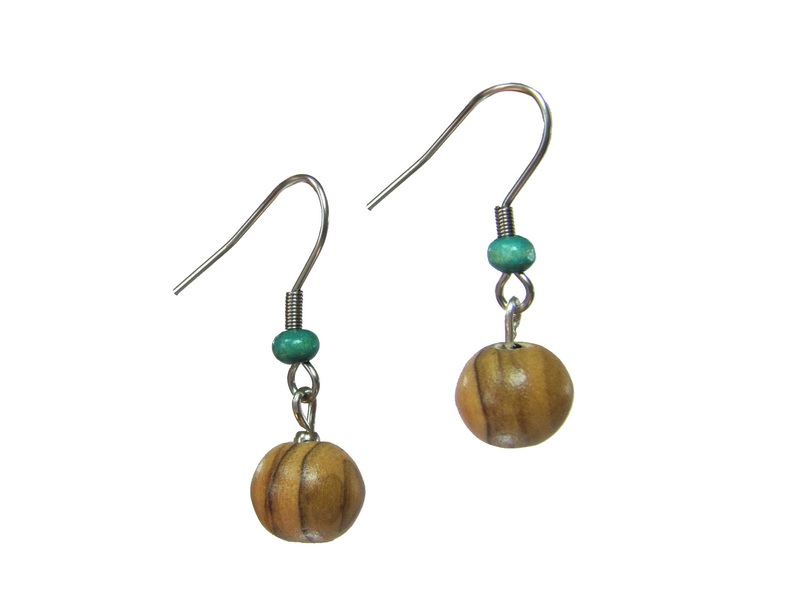 All of our From The Earth products are handmade and are guaranteed fair trade products. Like many women the girls of FTE love Valentine's day. Our very own, newly engaged, International Sales Manager is herself looking forward to receiving a gift from her fiance from the fair trade jewelry selection of From The Earth. Below are her top three choices (though she has a special favorite in the soon to be released new designs). Feel free to give her suggestions on which one she should request. 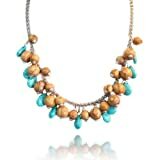 The Cluster Set features this lovely necklace, earrings, and a bracelet made from hand carved olive wood, and turquoise stones. 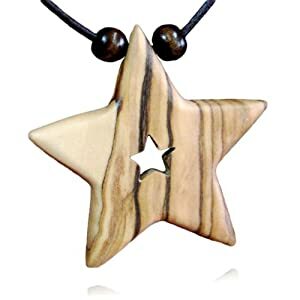 The Olive Wood Star Pendant goes perfectly with our new line of earrings. It's simple, yet fun and imaginative. 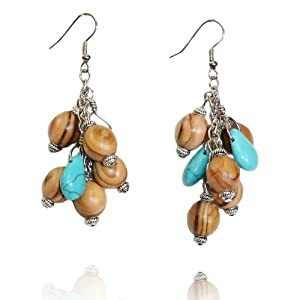 These lovely earrings are perfect for the woman with an elegant, long neck. 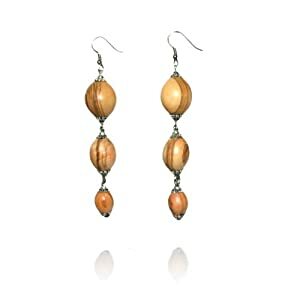 The hand carved olive wood beads are highlighted by light colored chain. 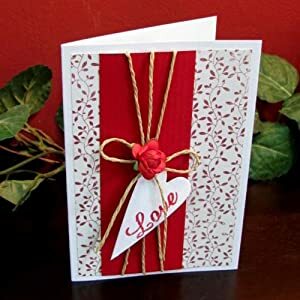 In return, she will be giving her fiance a handmade Valentine's card. Although there are several to choose from, this one is the one she has chosen. Love is truly in the air. We suggest you think ahead and purchase your sweetheart's, mother's, sister's, and friend's valentine gifts before these From The Earth items disappear. The employees of From The Earth are always looking for new, fun places to get a meal together after work. As we have been making our way through BeAmman's list of cafes, we ran across azkadenya and have now become frequent visitors. azkadenya is a cafe on Mecca street directly below TcheTche. Despite the comments on their Facebook page, each time we have visited the service has been wonderful, the food excellent, and the decor is unique in Amman. Let's actually start with the decor. The retro Arab feel is pretty sweet. Only complaint here is that the chairs on the opposite side of the comfy cushioned seating are a little high for the low tables. The plates and napkins are an excellent touch. The videos playing in the background add to the experience as well. The decor is great, but if the food isn't good then it isn't worth going right? Well, the food has all been delicious! Here is a link to their menu, but let's combine some of the FTE's employees favorites to make the perfect meal at azkadenya. To begin, both the tabouleh and the fattoush are wonderful. The pink humus is good too, but getting the sampler allows you to try all of the humus options. The royal mint is very tart. If you like a lot of lemon this is nice and tasty. For the main meal the fukharet gallaye with meat was so tender, aromatic, and delicious that it is hard to order any other main course on the menu. Finally, especially for the cold weather, the um ali bil fukhara is one of the best things you can put in your mouth. It is sweet, warm, and creamy with just the right amount of spices. After reading this, I hope you are convinced to visit azkadenya in the near future. I would suggest making reservations, although just stopping in works as well, but you may have to wait for a table. One of our least favorite tasks at From The Earth is deciding which products to discontinue. Even though, it is a necessary task in order to make room for the new, beautiful products that are coming this spring, it still breaks our hearts. Fortunately, you can benefit from our pain. 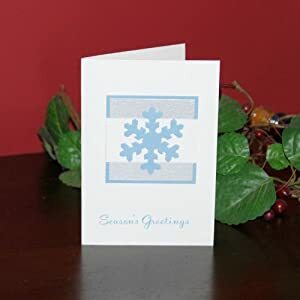 All of our discontinued Christmas cards will be 50% off on Amazon, Amazon UK, and in our Amman showroom. 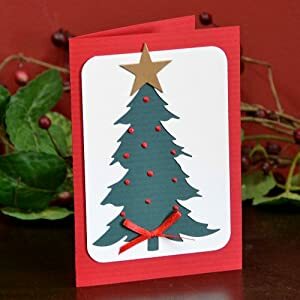 Here are the handmade Christmas cards that will be discontinued. Better purchase now before they disappear for good. Promotion ends on January 31, 2012. 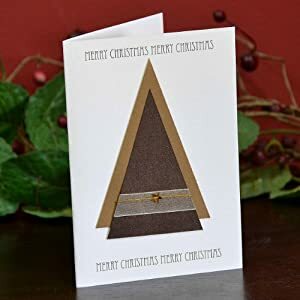 You can also purchase our other Christmas cards at a 20% discount. Why not save some money by stocking up now. Possibilities, opportunities, and unknown adventures await you in this new year. Are you ready to get started? In this new year how will you schedule your travel adventures, not miss any business opportunities, and know when you are free for whatever comes? How will you do all of this and still remember mother’s day, your father’s birthday, and your next important business meeting? Hmm….it sounds like someone needs a calendar. 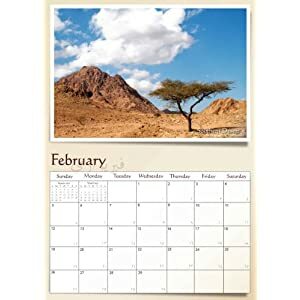 It just so happens that From The Earth has a fair trade calendar depicting the beauty of Jordan. It's not all Petra and sand. No, Jordan's beauty reaches beyond the desert to include the beautiful city of Amman, the ruins of Jerash, and the bright blue waters of Aqaba. For the month of January our Amazon US calendar is priced at $8.99 (that is a 25% discount). Our calendar can also be found on Amazon UK and in our many locations in Amman, Jordan. Grab your calender before the year starts getting away from you and thank you for purchasing fair trade.